Common household vinegar is one of those wonder products that people are always discovering new uses for. Whether you want to drive away dandruff, eradicate mildew, or keep bugs at bay, vinegar has been proposed as a solution to just about every problem under the sun. But while it has a number of uses, vinegar isn’t always the solution, and on occasion it can be downright dangerous. Here are the top 8 ways not to put this miracle substance to work in your home. 1. While vinegar is good at cleaning many things, you shouldn’t confuse it with soap. Alkaline cleaners like dish detergent are ideally suited for lifting grease, whereas vinegar will have little effect on it. If you have a greasy, tough household cleaning job, reach for regular soap and leave the vinegar on the shelf. 2. You should never use vinegar on waxed surfaces. The vinegar will only strip the wax off, dulling the sheen on your nicely shined car. However, vinegar is a great option if you’re looking to remove an old coat of wax before you put down a fresh layer of polish. 3. Do not use vinegar on your marble kitchen countertop installation or other stoneware, as it can cause the stone to pit and corrode, according to the Marble Institute. 4. Your smartphone and laptop monitor probably have a thin layer of oleophobic coating that limits fingerprints and smudges. Acidic vinegar can strip this off, so you should never use it to clean sensitive screens. 5. Cast iron and aluminum are reactive surfaces. If you want to use vinegar to clean pots and pans, use it exclusively on stainless steel and enameled cast iron cookware. 6. 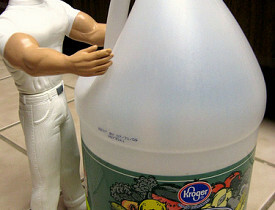 Although both bleach and vinegar are powerful cleaning agents, when mixed together they make a powerful chemical weapon. Chlorine gas, the stuff used to clear the trenches in World War I, results when bleach is mixed with an acidic substance, so never mix them together. 8. If you’re the victim of an egging, do not try to dissolve the remnants of this prank away with vinegar. Vinegar will cause the proteins in the egg to coagulate, creating a gluey substance that is even more impossible to clean up. I also feel obligated to say that although vinegar is touted as a great way to remove mildew and mold, like bleach it only kills surface mold. Most mold problems are deeper than what you see on the surface, and your best bet is to get rid of their source (which is usually plumbing leaks and rotting drywall).